Why are there always skidmarks here? they realize they need to weave one more lane left. Subject: i16i75 suggestion concerning "driver expectation"
I heard the i16i75 problem with "driver expectation" discussed several times at the GDOT presentations to Macon-Bibb politicians on 7-27-05. 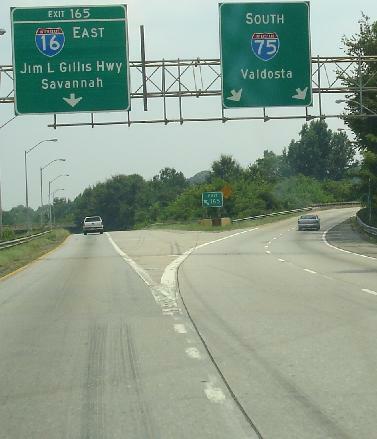 Drivers traveling south on i75 assume the exit to i16 will be on the right. But the exit is to the left. And the first notice of this situation is only 1 mile before the intersection. 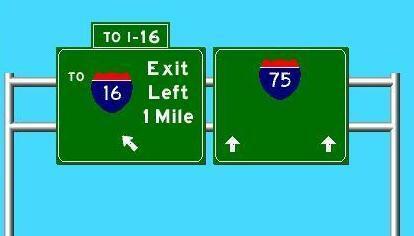 And this misleading sign says "I-16 Left Lane" - when the left lane actually stays with I-75...! Subject: FW: i16i75 suggestion concerning "driver expectation"
Thank you for your suggestion regarding the directional signage for the I-16 eastbound exit ramp at the I-16/I-75 Interchange. The existing interstate signing in this area was thoroughly reviewed as you suggested and it has been determined that some minor improvements should be made to the diagrammatic signs approaching the interchange. 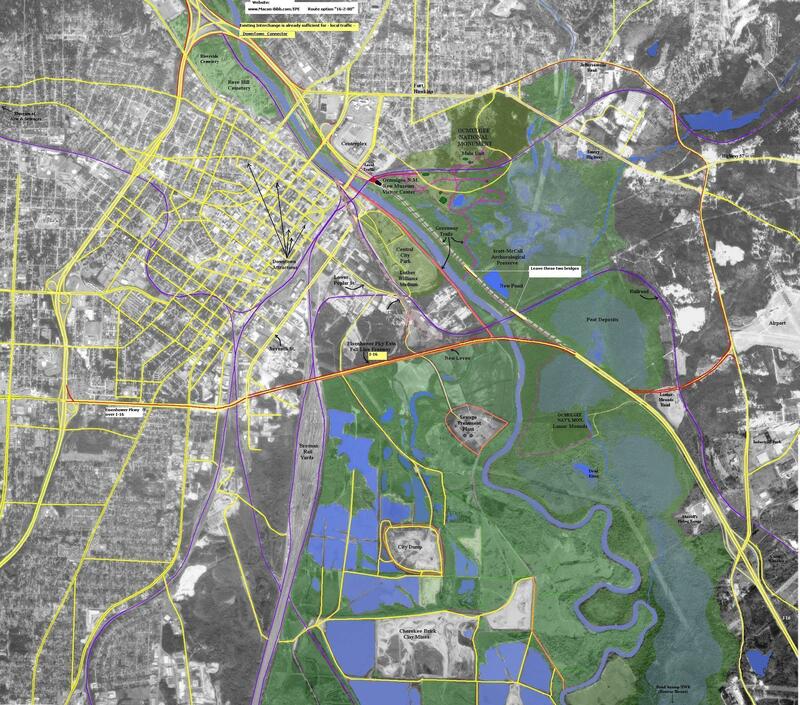 Such changes would serve as a temporary improvement until the I-16/I-75 Interchange projects are constructed. The designs to improve the diagrammatic sign layout are now underway. After the designs are completed, they will be forwarded to the Department’s Maintenance Office for fabrication. The process will take approximately two months for the signs to be fabricated and installed. Again thank you for your suggestion and interest in improving our transportation system. Well here again, another accident. A miracle that no one was killed. An 18-wheeler, with seven cars. 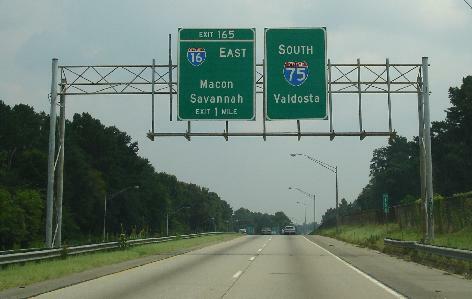 Just past the Department of Transportation building coming into Macon on I-75 south, there is an electric sign crossing the interstate. Messages are posted. Has the DOT thought about adding one of these, just past the Pierce Avenue exit? All people unfamiliar with this area could see this sign, showing "Sharp Curve Ahead, Slow Down -anything to make people pay more attention. Lives could be saved until something final is decided for this area. Is this too simple a solution? 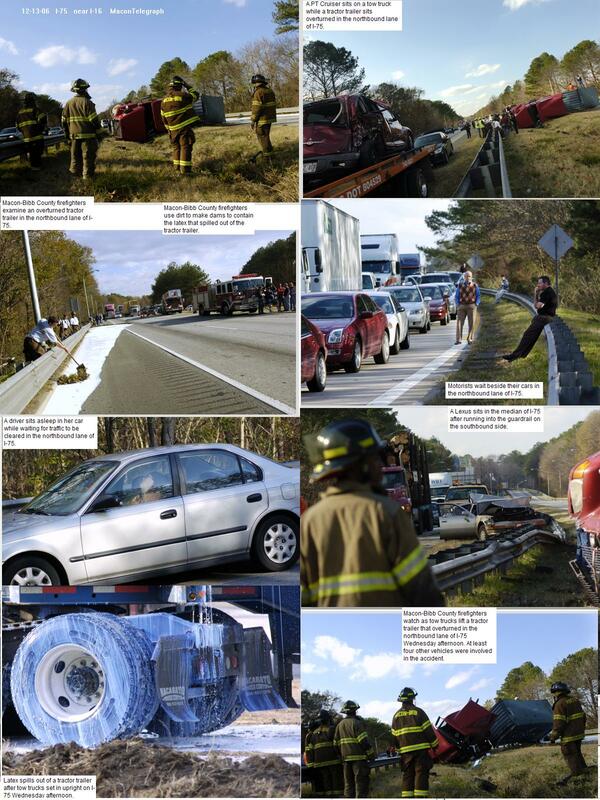 I have just finished reading the account of the truck accident and liquid latex spill on I-75 southbound at the 1-16 exit. Let me try to hazard a guess at what went wrong there. Motorists (and truck drivers) heading south on I-75 get an eyeful of a large overhead sign just before entering a left curve that goes over the railroad bridge. Curiously, this DOT sign leads them to believe that when they get to the next exit, two I-75 southbound lanes continue straight and persons wishing to exit onto I-16 must make a left turn to access the westbound ramp. Actually, when you approach the area in question, the observant driver will realize that the road configuration does not match what they saw on the sign less than a minute earlier. The actual road layout has the two I-75 lanes making a hard right curve (back over the train tracks) while the I-16 exit has a slowly expanding lane on the left side. 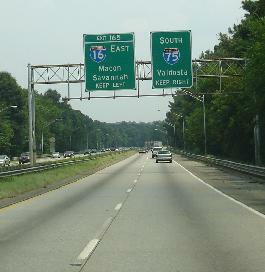 The I-16 exit is the roadway that physically continues straight. I cannot tell you how many times I have headed south on I-75 and exited onto I-16 while drivers in the left lane of I-75 continue past the exit only to discover there is no left turn to exit onto I-16. At that point, they invariably choose to cross the solid white lines, cross through the gore at 60 miles per hour, and force a merge into the established flow of traffic already on the exit ramp. It is not at all unusual to see drivers cross all the way from the right lane of I-75 and attempt this feat of derring-do and potential human sacrifice. Correcting the signage and changing the road markings to allow more time for an exit and a merge onto the I-16 ramp may alleviate some of these problems - but not all of them. It is my opinion that a map (after all, a sign depicting a roadway layout is just a map) should look like the road it represents. John F. Ricketson III is a resident of Monroe County. An accident blocked all lanes of Interstate 75 this afternoon and spilled liquid latex on northbound lanes. The wreck involved a tractor trailer and six cars and happened at about 1:40 p.m. north of the Pierce Avenue exit, according to the Georgia Department of Transportation's Web site. All lanes were reopened after 7 p.m., according to the Macon Police Department's radio room. The tractor trailer wrecked on I-75 south and flipped over the guard rail on to northbound lanes. GDOT workers are working to contain the liquid that spilled from the truck onto northbound lanes. At least four vehicles wrecked on southbound lanes near the tractor trailer, and workers are towing those vehicles and removing the tractor trailer. There are no serious injuries, Macon Police Sgt. Melanie Hofmann said. Traffic from I-75 south was diverted onto Pierce Avenue. Who should benefit from highway designs? I-16 can be re-routed to I-75 at US-80.